Christine Adams, age 19, was on hand this week to receive an official proclamation of commendation from township council. Mayor Rich Van Noord stands with resident Christine Adams at this week’s Mt. Laurel Township Council meeting where council honored Adams for her role as Burlington County’s 2018 Miss St. Patrick. It wasn’t quite “Christmas in July” at this week’s Mt. Laurel Township Council meeting, but the meeting did have a slight holiday theme when council honored Mt. Laurel resident Christine Adams for her role as Burlington County’s 2018 Miss St. Patrick. As a lifelong Mt. Laurel resident and someone proud of her Irish heritage, Adams helped lead this year’s Burlington County St. Patrick’s Day parade in downtown Mt. Holly on March 3. 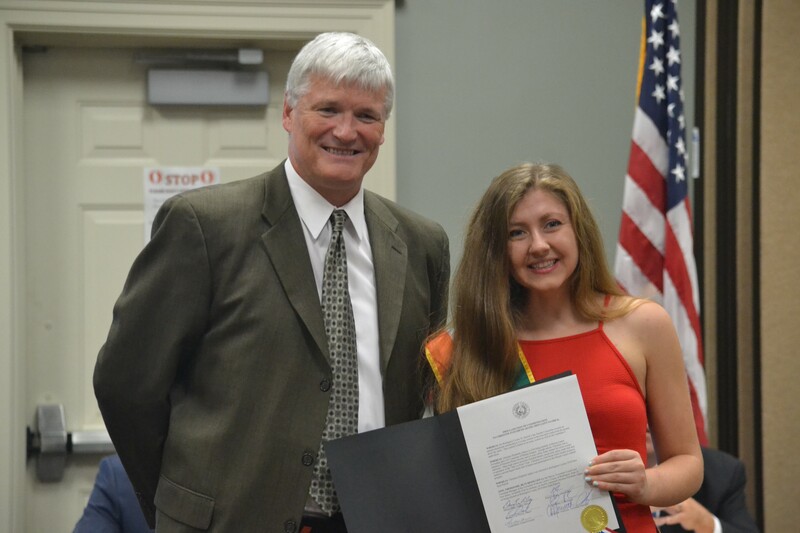 Now home again for the summer from Towson University in Maryland where she majors in mathematics, Adams, 19, was on hand this week to receive a proclamation of commendation from township council for her role in this year’s parade. The role of Miss St. Patrick is decided by the Burlington County St. Patrick’s Day Parade Committee, which solicits essays and applications from young women in Burlington County each year for the chance to win an educational scholarship and lead Burlington County’s only St. Patrick’s Day parade. Adams described the event as a fun and exciting experience, where she also helped with raffles, 50/50s and joined the parade grand marshal to judge contests such as the parade’s dance troops, bands and most spirited participants. With a smile on her face, Adams said being Miss St. Patrick also helped fulfill her dream to ride on a parade float. “It was just such an exciting opportunity and I was just so blessed to receive it,” Adams said. In addition to Miss St. Patrick, Adams has also been involved with a number of other local activities in her life. A 2017 graduate of Bishop Eustace High School, Adams was a member of the National Honor Society and a four-year varsity letter winner for cross country and track. While in high school, Adams was also part of Bishop Eustace’s theater program, mock trial, choir, math club and “She’s a First” club. Adams is also a recipient of the Girl Scout Gold Award, which is the highest achievement in Girl Scouts. To earn the award, Adams channeled her active lifestyle in cross country and track to provide fitness classes and exercise equipment to a homeless shelter for pregnant women and their children. Adams has also earned a second-degree black belt in karate, participated in the Mt. Laurel softball program and currently works for Mt. Laurel’s summer camp programs. Reflecting on her busy schedule, Adams said she’s learned a lot about time management. To learn more about Adams’ role in this year’s parade or the parade itself, visit www.mounthollyparade.com.